Perfect for boat and livewell drains. 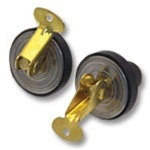 Neoprene plug features a brass mechanism and top/bottom plates. Create a watertight seal with this easy-locking plug! Won't jar loose with boat vibration.